…Clinton alumni and boosters—like former press secretary Brian Fallon, Nick Morrow, and Eric Boehlert—decried what they viewed as a double standard for Clinton and Romney. Fallon wrote that Romney should focus on knitting rather than politics, referencing a Vanity Fair video last month in which writers jokingly offered New Year's resolutions for Clinton, including one female writer who suggested she could take up knitting. Though it was part of a series of videos mocking other politicians and Vanity Fair is an openly left-leaning publication, Clinton backers and other liberals ripped the joke as sexist, and the magazine subsequently apologized. Mitt Romney lost and the media is begging him to run for office. Hillary Clinton won the popular vote and they told her to take up knitting. Sexism at work. Strange how losing male presidential candidate Mitt Romney is being immediately discussed as a replacement for Orrin Hatch’s senate seat and isn’t being told to take up knitting! Isn't Mitt Romney supposed to take up knitting and go away forever? Or is that just Dem women? Mitt Romney may run for Senate? I thought failed presidential candidates were only allowed to take up knitting. Yeah, whatever, guys—Hillary has a book that torched pretty much everyone, blaming Joe Biden, Obama, the FBI, James Comey, the media, Bernie Sanders, the Democratic National Committee, and the Russians for costing her the 2016 election. She has a super PAC that fights the Trump agenda and is projected to give monetary support to 2018 candidates as well. Maybe the bitterness of losing in 2016 still stings with the alumni of the Hillary campaign. I guess she could run for something else if she wanted to, but she said she’s done with running for office. Yet, plans can change. Oprah Winfrey said she was a no-go on 2020, now—she’s reportedly mulling a run. I hope Hillary goes away, but she is useful as a GOP punching bag. 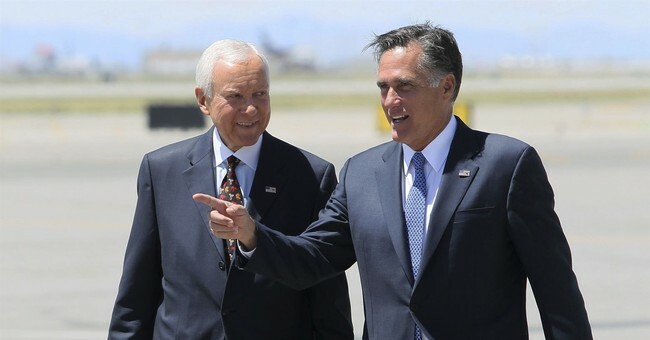 As the Clinton camp whines, Romney could become Utah’s next senator.